Gluten Free Bacon Jalapeño Cornbread | Great gluten free recipes for every occasion. This gluten free bacon jalapeño cornbread is light and fluffy, plus smoky and even a little bit sweet and spicy. I served it alongside an easy buttermilk-marinated grilled chicken and simple garden salad, but it would be completely at home with a hearty bowl of chili. Believe it or not, one of the most searched-for recipes on this old blog (did you know that I first started this blog in May 2009?) is gluten free cornbread. The recipe that comes up early and often when you google “gluten free cornbread” is this one. It’s long been a favorite in my family—and, I dare say, in some of yours. It’s naturally gluten free (no all purpose gluten free flour—just cornmeal), and a version of it even made it into my first cookbook. 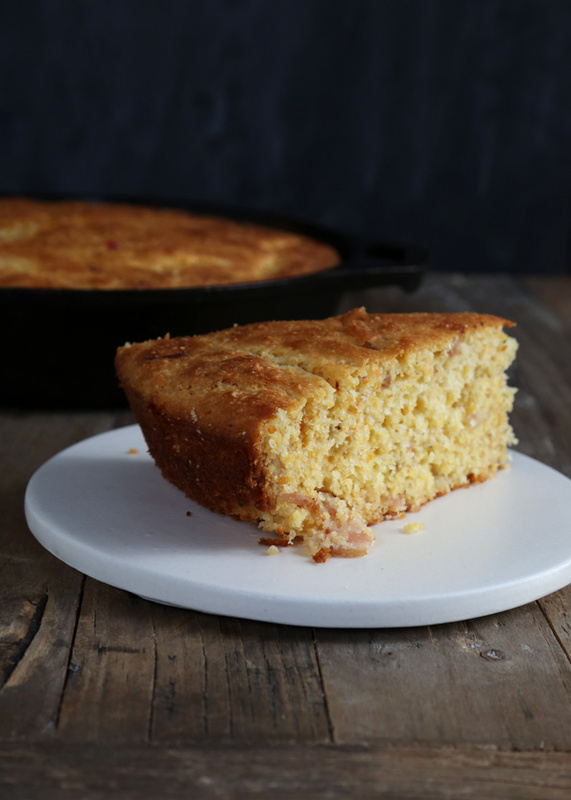 This super fluffy cornbread is about half all purpose gluten free flour, half cornmeal, with smoky bacon (and bacon grease!) and sweet and spicy jalapeño jam. But you can make it with any type of jam (call it Bacon Cornbread) and even without the bacon (but why would you want to?!). 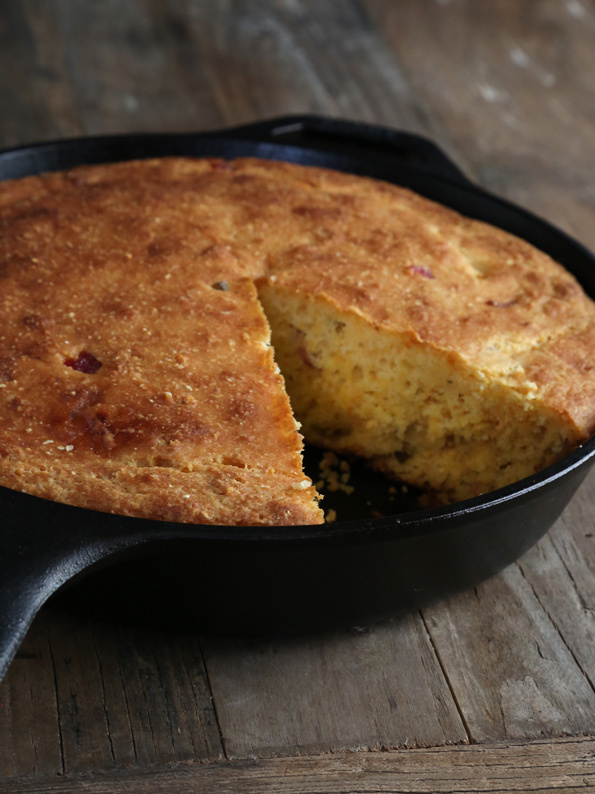 Like any cornbread, it’s best when baked in a cast iron skillet. But if you don’t have one, don’t let that stop you! Just bake it in a 9-inch round or square baking dish. My current favorite brands of baking dishes are stainless steel Nordic Ware and Fat Daddio. They’re not nonstick, but nothing sticks to them when they’re greased, and they bake really evenly. I usually buy them on amazon.com. 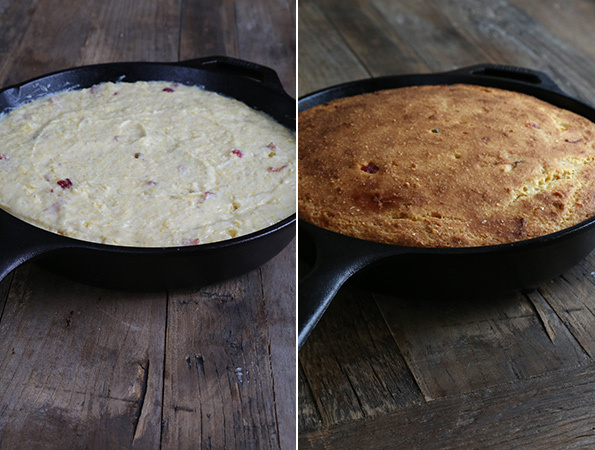 But nothing beats the crust you get by baking cornbread in a cast iron skillet. Mine is a 12-inch preseasoned Lodge cast iron skillet, and it gets a workout in my kitchen almost every day (and Lodge cookware is so economical). What cookware or bakeware do you reach for first, day after day? *When the bacon is cooked in Step 1 of the directions, it will leave behind rendered bacon fat—the most delicious fat ever known. I pour off the rendered bacon fat into a small, heat-safe bowl and allow it to cool to room temperature. Then, I use it to replace an equal amount, by weight, of unsalted butter in the ingredient list. Preheat your oven to 375°F. Grease well a 12-inch cast iron skillet (or a 9-inch square or round cake pan) and set it aside. In a medium-size, heavy bottom saucepan, cook the bacon pieces over medium-high heat until cooked through (about 5 minutes). Transfer the cooked bacon to a small, heat-safe bowl and pour off the bacon grease into a separate, small heat-safe bowl. Set both aside. In a large bowl, place the cornmeal, flour, xanthan gum, baking powder, baking soda and salt, and whisk to combine well. Create a well in the center of the dry ingredients and add the butter (reduced to account for the optional bacon grease, if using), the optional bacon grease, jalapeño jam, eggs, honey and buttermilk, mixing until just combined after each addition. The batter will be thick. 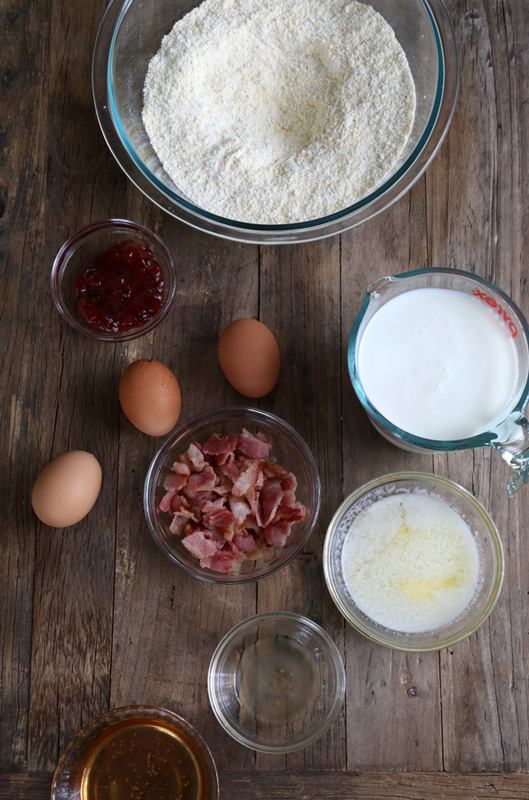 Add the cooked bacon pieces, and mix just until the bacon is evenly distributed throughout the batter. Transfer the batter to the prepared skillet or pan, and smooth into an even layer. Place in the center of the preheated oven and bake for 25 minutes. Lower the oven temperature to 325°F and continue to bake until a toothpick inserted in the center of the cornbread comes out with, at most, a few moist crumbs attached (another 10 to 15 minutes). Remove from the oven and allow to cool for 10 minutes before slicing and serving. This just came in my email. I am having chili tonight so, I think I will make some of this up! YUM! Oh my, oh my, oh my! I cannot wait to make this! I have 4 cast iron skillets – 1 smaller one, one saute/frying pan type that isn’t deep and 2 deep. They all get used! Can’t beat cast iron skillets for versatility, Mare! The first ever GF conversion I made was our family favorite cornbread muffins, I haven’t baked one in the cast iron pan before. It looks fabulous! Yea – this looks wonderful. You could even then make cornbread croutons for chili or tomato soup with this baby!!! thanks for another great one! Cornbread croutons? You are a genius! Ooooh, Jennifer, that sounds amazing. I’ll take mine in tomato soup—a fall favorite! Bacon and jalapeño and cornbread?? Wowza! Can’t wait for it to cool off here!